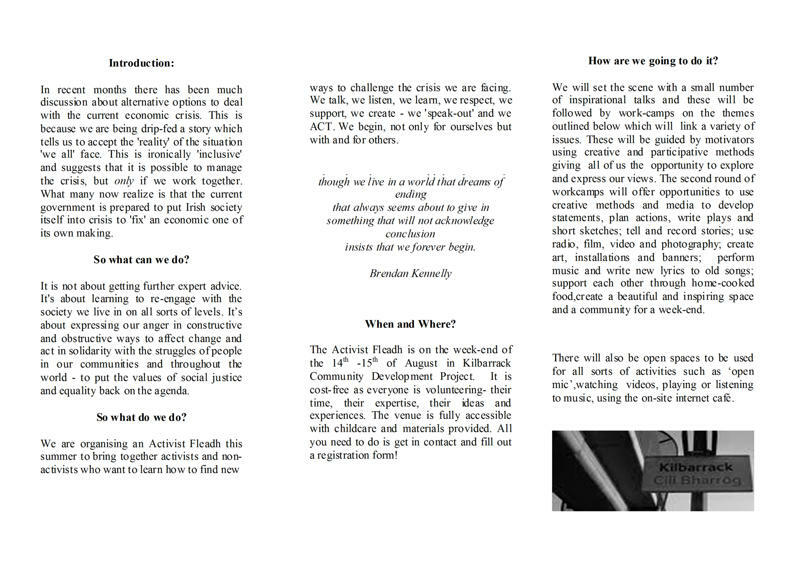 Kilbarrack CDP is hosting a summer school for radicals of all ages on Saturday 14th and Sunday 15th August. In recent months there has been much discussion about alternative options to deal with the current economic crisis. This is because we are being drip-fed a story which tells us all to accept the "reality" of the situation we face. This is ironically "inclusive" and suggests that it is possible to manage the crisis, but only if we work together. What many now realise is that the current government is prepared to put Irish society itself into crisis to "fix" an economic one of its own making. It is not about getting further expert advice. It's about learning to re-engage with the society we live in on all sorts of levels. It's about expressing our anger in constructive and obstructive ways to affect change and act in solidarity with the struggles of people in our communities and around the world – to put the values of social justice and equality back on the agenda. We are organising an Activist Fleadh this summer to bring together activists and non-activists who want to learn how to find new ways to challenge the crisis we are facing. We talk, we listen, we learn, we respect, we support, we create – we "speak out" and we ACT. We begin, not only for ourselves but with and for others. 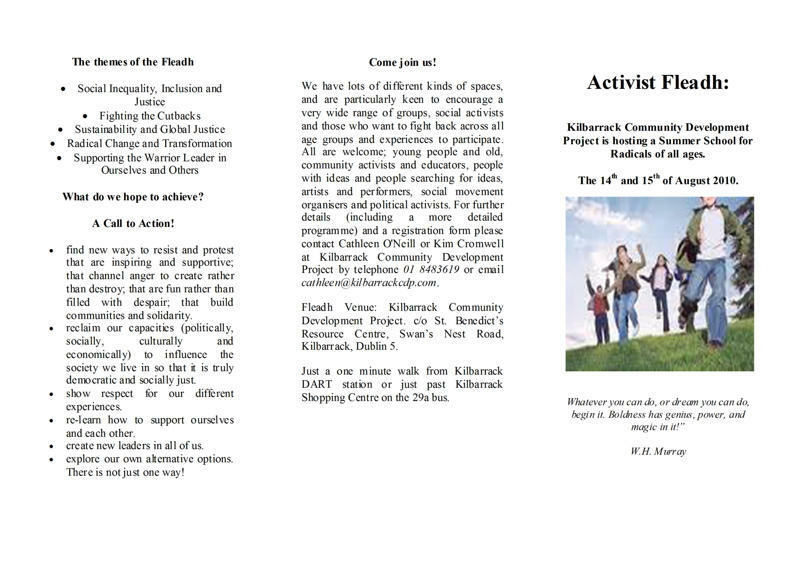 The Activist Fleadh is on the weekend of the 14th – 15th of August in Kilbarrack Community Development Project. It is cost-free as everyone is volunteering – their time, their expertise, their ideas and experiences. The venue is fully accessible with childcare and materials provided. All you need to do is get in contact and fill out a registration form! We will set the scene with a small number of inspirational talks and these will be followed by work-camps on the themes outlined below which will link a variety of issues. These will be guided by motivators using creative and participative methods giving all of us the opportunity to explore and express our views. The second round of work-camps will offer opportunities to use creative methods and media to develop statements; plan actions; write plays and short sketches; tell and record stories; use radio, film, video and photography; create art, installations and banners; perform music and write new lyrics to old songs; support each other through home-cooked food; create a beautiful and inspiring space and a community for a weekend. There will also be open spaces to be used for all sorts of activities such as "open mike", watching videos, playing or listening to music, using the on-site internet café. What do we hope to achieve? A call to action! - find new ways to resist and protest that are inspiring and supportive; that channel anger to create rather than destroy; that are fun rather than filled with despair; that build communities and solidarity. - reclaim our capacities (politically, socially, culturally and economically) to influence the society we live in so that it is truly democratic and socially just. - show respect for our different experiences. - re-learn how to support ourselves and each other. - create new leaders in all of us. - explore our own alternative options. There is not just one way! We have lots of different kinds of spaces, and are particularly keen to encourage a very wide range of groups, social activists and those who want to fight back across all age groups and experiences to participate. All are welcome: young and old, community activists and educators, people with ideas and people searching for ideas, artists and performers, social movement organisers and political activists. 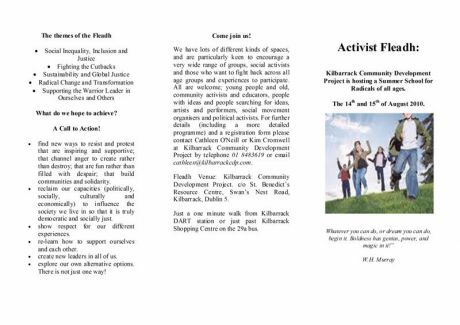 Fleadh venue: Kilbarrack Community Development Project, c/o St Benedict's Resource Centre, Swan's Nest Road, Kilbarrack, Dublin 5. Just a one minute walk from Kilbarrack DART station or just past Kilbarrack Shopping Centre on the 29a bus. - What are the big structures of power and inequality that shape our world, and how do we meet them? - How can our local struggles connect to large-scale strategies for change that have a real chance of success? - What is the "big picture" in terms of global justice and ecological sustainability, and where do we fit in? - How do personal transformation and the development of leadership come into the struggle for a better world? This work camp will concentrate on developing creative ways to resist cutbacks and changes in policy, and most especially to identify and challenge what has been happening to leaders (formal and informal) in the community development, equality and disability sectors. We plan to write articles, poems, verse and limericks and anything else that comes up during the workcamps. Creative support and inspiration will be provided (as will computers and powerpoint access). Most of the time our work has to be in a specific place, around a specific issue - but we are motivated by the thought that our local efforts, together with the struggles of other people in other places around other issues, might add up to a much bigger change. This work camp will be around "joining the dots" - getting from structures of inequality to a just and sustainable world, bringing together personal change and effective protesting into effective struggles for change that might really make a difference on a large scale. The scale of global inequalities can make action for justice at a global level seem daunting. This workcamp will link some of the causes and impacts of structural inequalities in Ireland with those of people throughout the world. It will further explore if and how we can forge solidarities between ‘local’ struggles for economic, social, political and environmental justice and those being undertaken by people in the Global South. This work-camp will explore how, our human potential is developed, not only through looking at how we relate to ourselves and those close to us, but also by becoming aware of how we influence society and the world by our thinking and our actions or inactions. Through different activities, participants will work towards an understanding of how to be more effective as active agents of sustainable change in the wider community, while also respecting and supporting each other in a supportive and holistic process. Possible tools and traditions being drawn on: authentic leadership; yoga; 'mindfulness' meditation; story- telling; deep listening; liberation theology. Change takes many forms; it doesn’t have to be a global, economic or even community change to be significant. In order to seek change on a larger scale we sometimes need to look within to find the strength and courage to make some changes for and in ourselves. We then may feel ready to move to bigger changes. Continuing a legacy of generations before us is easy as sometimes it is all we know. However change making and pattern breaking are possible and achievable. This work camp will support participants to identify changes they can make. 2.30 - Creative Media Workcamps – planning actions, making statements, plays, stories, photos, films etc. The programme on Day two - the 15th- will have broadly the same format with people being able to choose a different set of workcamps from those selected on Day one. Day two will close at 4.00pm with a closing celebration and viewing of work achieved along with a ‘promise’ of one action arising out of work and discussions over the week-end. It sounds like a very constructive and positive thing ye are doing. May I ask who you are, what is the background of the organisers? The quick answer is that the organising core is myself (NUI Maynooth MA in Community Education, Equality and Social Activism), Cathleen O'Neill (Kilbarrack CDP), Kim Cromwell (Kilbarrack CDP), Maureen Bassett (independent consultant on education and social development), Jean Bridgeman (Women of Insight, Kildare), Niamh McCrea (UCD Equality Studies), Augusta McDermott, Maura Gallagher (Langtrain Intercultural Training) and José Antonio Gutiérrez (Latin America Solidarity Centre). There are about another 20 people in a wider support group - mostly community activists, trade unionists, and supportive academics. A basic policy is that this is "a process not a platform" - ie that the various sessions are designed to treat participants as equals and develop a discussion rather than have different groups trying to "sell their wares" (however important!) to each other. Ie the idea is for activists to be able to connect with each other across the big gulfs of different issues etc. in the context of the current crisis. It will be run very much on adult / community ed principles. The background for the Fleadh comes out of a discussion following a talk to the UCD "Equality in a time of crisis" conference (available via http://www.ucd.ie/ewi/mariecurie/conference1.html) and an invitation from Cathleen O'Neill to those interested in the idea of an activist summer school to hold it in Kilbarrack.